volan laminate on bottom with rail lap onto deck, S glass deck laminate, resin pinlines, spray art. Post production leg rope plug. Bottom: flat - slight concave - flat - slight vee behind fin. Bottom: Foil shaped Wave and sun and three birds spray art bordered by black resin pinline, red spray foil pinline. Purchased new 1975 Bondi Surf Shop, post production plug added. Purchased Rose Valley NSW January 2001 from original owner, board with original home made canvas board cover. Offered for sale at Mick Mock's Sydney Surf Auction, Mona Vale, October 2004. 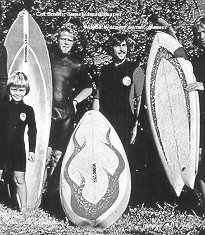 A sponsored surfer/shaper for Keyo Surfboards, McCoy Surfboards and then Terry Fitzgerald's Hot Buttered Surfboards 1972-3, Col Smith (North Narrabeen) begun Morning Star Surfboards in 1975. Like fellow North Narrabeen surfers, Terry Fitzgerald and Simon Anderson (Energy Surfboards), he quickly became an estalished manufacturer. 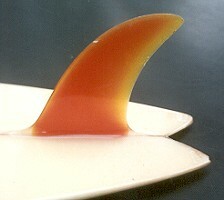 Early output included models for Mark Richards and glassing Nat Young Surf Design shapes, June 1976. Shaper Paul Holmes was also added at this time, replaced by Ron Ford by the summer of 1977-1978. 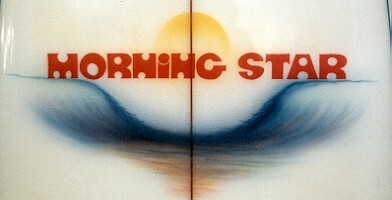 In late 1979 Morning Star Surfboards produced the first Tom Carroll model. Long time glasser Wayne Warner, with son Brett, revived the label in 1996 at 236 Harbord Road, Brookvale NSW, 9938 5316.